News! Midi versions of five of the arrangements are now available on Itunes. Search Itunes for "Bach Superstar Locke" to see the five arrangements. You can also buy hear samples and buy thru CDBaby. See also The Phantom of the Orchestra and Peter VS the Wolf, 2 other family concert programs for orchestra and actors. < a href = "contact.htm">Questions? Send me an email! After the overture, we find ourselves in the home of Johann Sebastian Bach and his 22 children. Johann loves writing his music but alas, success has eluded him. As dinner guest Georg Friederich Handel points out, this is because Bach's music is "too old fashioned." Feeling a financial pinch with so many young mouths to feed, Johann decides he need to do something to further his musical career. But what? His children gather round and suggest that their father get a promotional agent. Bach scoffs at this idea, but it's too late. His children have already hired one. The newly hired agent appears, but this is no ordinary agent. He is right out of modern day Los Angeles. None of the characters ever notice the time schism. After listening to Bach's music, the agent also points out that Johann's music is, in fact, "too old fashioned," but the agent decides Johann may have "some talent" and signs him to a limited contract, hoping to make a quick buck off his new client. The scene then changes to a soundstage in Los Angeles (or New York) where the agent plans to record Bach's music and make promotional dance videos at the same time. Much to Bach's horror, the Agent has hired an arranger to "fix up" the music to make it more appealing to a mass audience; and we hear various famous famous Bach pieces played in modern pop idioms, including latin, disco, country, and even rap. The music/dance numbers are interspersed with the Agent making excited presentations of various "tie-in's" and other marketing schemes that will maximize profits by exploiting children. After hearing all the new arrangements, Johann suggests that he write his own "modern" arrangement of his music, and the agent reluctantly agrees. However, Bach's "modern" arrangement is in "Swing" style -- which, according to the agent, is, again, hopelessly old fashioned. So the CD is released. All of the Agent's sleazy marketing schemes come to naught, but Bach's own "swing" arrangement becomes a sleeper hit and goes to the top of the charts. Much to the Agent's amazement, Johann becomes . . . a Superstar. Note: This show is intended to be a grand production, with sets, costumes, and choreography, although it could be done in a simpler "concert" version with a few actors. The musical selections (both the original Bach music and the pops arrangements) are extremely challenging and are not recommended for non-professional ensembles. Note, the arrangements may be rented separately. Good afternoon Ladies and Gentlemen, Boy and Girls. 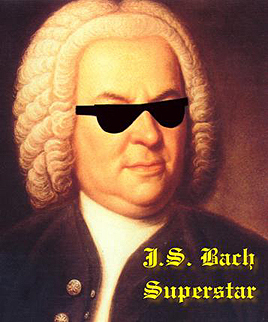 Welcome to J. S. Bach, Superstar. This is the story of how Johann Sebastian Bach became so famous. Our story begins a long time ago, when Johann Sebastian Bach, or "Johann," as his friends called him, was living in a little town in Germany with his wife and -- would you believe it?-- his twenty children. Johann loved to compose music. All day long he would think up melodies in his head, and then he would write them all down. He composed pieces called cantatas, and fugues, and partitas, and, well, just all sorts of things. There was only one problem. Even though Johann loved to write music, and he worked very hard at it, no one else seemed to think his music was any good. Sometimes this made him very sad, but Johann loved his music so much he couldn't think of doing anything else. So he kept trying and trying, and composing and composing . . . and failing and failing. Mr. Handel was also a composer of music, just like Johann. But there was one big difference: Mr. Handel was a very famous composer, while Johann was not famous at all. Mr. Handel applauded and said, "Ah, Bravo, Bravissimo, Johann, that was wonderful. I love contemporary music. What else have you composed recently?" Delighted to be noticed by such a famous composer, Johann quickly rummaged through the music on his harpsichord, and started to play another one of his compositions. As he played, Johann leaned over to Handel and quietly asked him a question. "Listen, George," said Johann, "I think the pieces I write are very good, but no one else seems to think so. I can't figure it out. You're a famous composer, and I'm not. What's your secret?" "What do you mean, old-fashioned?" said Johann. "Don't be offended, Johann," said Handel. "Personally, I think your music is marvelous. Your melodies are lilting, your harmonies are spectacular, your counterpoint is genius, but . . . "
"Well," said Handel, "the fact is, no one is writing cantatas, or fugues, or partitas any more. They're outdated! You need to be more progressive!" "How do I do that?" said Johann. "Well," said Handel, "why don't you write a symphony? They're very fashionable right now. Or even better, why not compose an opera? They're the latest thing! They're new and exciting! They have lots of action and costumes and drama! People love them! You see, Johann," said Handel, "there is a simple reason why all the other composers-- like Vivaldi, and Telemann, and me-- are so much more famous than you: because we give the public what it wants. You should think about this, Johann, because you have a lot of mouths to feed." Just then, the bells in the local church tower began to chime. [Perc or synth plays] "Oh," said Handel, "it's getting late. It's almost time for the royal fireworks, and I don't want to miss them." And so Mr. Handel got up to leave. But as he ran out the door and down the street, he shouted back, "Gute Nacht, Johann, and remember what I told you: DON'T WRITE STUFF THAT'S OLD-FASHIONED!" Johann smiled and waved goodbye, but in his heart he was very sad. Even if his music was a little old fashioned, he loved his music so much he couldn't bear the thought of changing it. It was at this moment that his wife, Anna Magdalena, presented him with that week's grocery bill. "I've got to do SOMETHING," said Johann. "But what?" Just then, one of Johann's sons, Carl Phillip Emmanuel Bach, jumped up and said, "Hey, Dad, I have a great idea! Why don't you hire an agent you know, a Manager to promote you and your music?!" But Johann was very hesitant about such an idea. "Harrumph," said Johann. "Where would I find the time? You know I have to write a cantata for the church services every Sunday. And besides, even if people actually wanted to come and hear my music," he said, "where are you going to find this . . . this . . . this Manager or whatever it is you called him?" There was a long pause as Johann's children looked at each other very sheepishly. "Well, Dad," said Johann's oldest daughter, Catherina Dorothea Bach, "the fact is, well, uh, we sort of already found one, and he's . . . "
"And HE'S WHAT?" said Johann. "And he's coming over tonight!" said Johann's youngest son, Johann Christian Bach. "Well, this time you kids have gone too far," said Johann. And into the room walked one of the most remarkable men Johann or his children had ever seen. Get away from me kid, ya bother me. [Looks around] Man, I didn't know people lived like this. [to Johann:] Oh, sorry. Allow me to introduce myself. Rudolph la Paix's the name. My card. My friends call me Rudy. I manage talent when I can find it. Hey, maybe you can help me out here. I'm looking for . . . Lessee I got it written down here someplace . . . someone named . . . [pulls out a palm pilot] . . . BATCH." Uh . . . That's Bach. That's Bach. Johann Sebastian Bach. Johann Sebastian? (sniggers) We can fix that. So Johann, what do you do? Stand up? Impersonations? Motivational speaking? Uh . . . I play the organ . . . The organ? I used to manage a guy who played the organ. His monkey died. He was no good as a solo act, so I had to dump him. All right. You play the organ. You do anything else? Uh . . . I also play the harpsichord, but mostly I am a composer. A composer? What kind of composer are you? Well I guess you could say I'm a Baroque composer. Yeah, well, life is tough all over. I mean, what kind of stuff do you write? Um . . . many kinds of things. I write cantatas, sonatas, fugues, dances . . .
Dance music. Fabulous. What is it? Disco? Salsa? Merengue? Well actually it's more like courantes, sarabands, allemandes, gigues . . .
Whoa, Johann, I'm usually pretty hip to the latest street jargon but you're way ahead of me. Look-- let's not bother talking about it. I do this by instinct. I can smell a hit tune a mile away. Just lay it on me, Jack. That's it? . . .
Well, it's . . . different. You got anything else? You know, maybe a few steps above a funeral march? No, that's not it. Got anything else? Naw, that's no good. Johann, baby, I'm hungry for a BEAT. Well, we have some carrots and potatoes in the root cellar . . .
Don't change the subject. What else have you got? Wait a minute, wait a minute, cut the music, cut the music. We keep playin' in the same ballpark here, Jack. Look, Johann, I love you, I mean that honestly and sincerely, but this music . . . how can I put this? It's . . . It's . . . It's TOO OLD FASHIONED. That's what everybody tells me. Look, Johann, led me shed a little light on your dim little world, okay? You composers, you all have the same problem-- You get too emotionally involved in your work. You get all hung up on "content,"and everything bogs down! Take a good look, Johann! You're in a rut, up to your axle! Johann, baby, I love you, and I respect you and your work, I mean that honestly, I mean that sincerely, but Johann -- It's time to wake up and face the cold hard facts of the modern marketplace! You see this? Today it's a nice little fugue. Tomorrow . . .
they'll wrap a fish in it! [Pointing at all of Bach's manuscripts:]Wait a minute. Johann, did you write ALL of this music? Well, yes, that's what I wrote THIS week . . . And I have something else here I call the art of the fugue . . . it's here somewhere . . .
Never mind about that . . . Ya know, this slush pile of yours has me thinking . . . QUANTITY is, by itself, a quality . . . . and when you think about the modern music market, digital cable TV has 750 channels, all of them needing music 24 hours a day . . . And all this music you wrote, I mean, a million monkeys, a million harpsichords, there must be something in here we can salvage . . . Call me a wild eyed optimist, Johann, but your music, I mean, ya know, it's . . . rough . . . we'll have to refine it a little, but if we massage it the right way . . . we could create a whole brand-- put heavy focus on the packaging, create our own network of distribution, and sell to every market demographic at varying price points. If we promote it the right way, the sky's the limit. I can see it now-- what a vision! Ancillaries, tie-ins, cross-promotions, the works. You'll be on the talk show circuit-- Larry, Cristina, Montel, Dave, Jay -- OPRAH! You'll have your own exercise video! Your own diet books! You'll be on Hollywood Squares--the center square, too, not off to one side! Johann-- I am about to give you the greatest gift anyone can ever give to another human being. I'm going to make you . . . A CELEBRITY. Just sign here. [Signs] But I don't see any of this. Johann, baby, you're late. Time is money. Let's get started. Have a seat, here's your keyboard. Well, nowadays, yeah, I guess so. Okay, you guys ready in the band? Ready in the booth? Take one. Hit it. Whoa, whoa, cut the music, cut the music. What's the matter? I thought it sounded pretty good. Yeah, yeah, Johann, it's good, we all think it's good, and I mean that honestly, I mean that sincerely, but Johann . . . It NEEDS something, ya know? Now Johann, I guess I should have told you sooner, but anyway, we had an arranger come in today, and he kind of sort of fixed things up . . .
Now Johann, hear me out, hear me out, we didn't do that much to it, your music just needed a little nip here and a tuck there . . . And by the way, your kids were just taking up space so we decided to put them into the promotional video- you know, play up the kid angle. So come on up into the booth, Johann, and listen to your future in the entertainment industry! Hit it! So, Johann, how's that grab ya? Mr. La Paix . . .
Rudy . . . I don't mean to be difficult, but I am concerned about the changes you made to the music. Well, you added several instruments . . . I'm not even sure what they're called. Oh, well, there's the drum set, [Musicians demo as cued:] Bass guitar, a rhythm guitar, Electric Piano, and saxophones [etc.]. But that's not how I wrote it! You changed my music! Johann, "change" is such a harsh word. We didn't "change" your music-- We would never do that. We just took out the boring parts. Believe me, NO ONE will miss them. And then we added a little "zip" to it. That's not a "change." But these instruments aren't in the original piece! Johann, Johann, I see your point, and I want to tell you how happy I am that we have a relationship where you can come to me and express your concerns openly and honestly. That touches me Johann, I mean that honestly and sincerely. But Johann, I want you to know, this isn't a problem at all. No. And I'll tell you why, Johann. Because all those extra instruments were added at absolutely NO COST TO YOU. That's just the kind of guy I am. Johann, Johann, not another word, your gratitude is embarrassing me. Besides, we need to move on here! Time is money. [Optional ad libs to orch and dancers: "Get ready for the next number. (etc.)"] So Johann, last night I was looking at your "chorale" music. Now don't take this personally, Johann. I love you, you know that I mean that honestly and sincerely, but gee whiz, these chorales of yours are the worst cowboy music I've ever heard. And by the way, that's not how you spell "corral." But Johann, you inspired me. Country music is a huge market -- and we asked some gold ol' boys to come in here and see what they could do with one of your slow pieces. Wait 'til you hear this! Rudy, you have taken an enormous amount of artistic license here. Johann, I'm impressed. A lot of musicians don't realize that the music itself never makes any money-- it's all in the licensing! For example, let me show you . . . . TA DAAA! It's your very own . . . snack food. This is the first of many cross-promotional tie-ins. We call them "Cantatos." (Points: "Bet you can't write just one.") They come in three flavors-- Cheese, Barbecue, and Extra Cheese. [Looks at the box quizzically] What exactly are they? I mean, are they corn, rice, wheat? There you go again Johann, with that old fashioned thinking. I learned an interesting fact the other day, Johann. Did you know that to grow an ear of corn, or just one kernel of wheat, it takes months? MONTHS, Johann. I mean, who has that kind of time any more? How these people stay in business I'll never know. We didn't want to make ourselves dependent on a supplier with those kind of delays built into the pipeline, so we developed a process that works overnight. We can go from raw materials to finished product in less than an hour. I'm not sure I understand. What does food have to do with my music? Uhhh . . . Johann, actually, a small point, but the legal department says we can't call it "food." It's more like a "food product." Well, I won't bore you with a lot of technical jargon. Suffice to say, it's a simulated protein based on polystyrene. It's 100% pure. Just think! We've completely eliminated the possibility of getting any dirt from a farm into your food. Instead, it's all made in a sterile laboratory. It's a great marketing angle. Plus, we added the four basic kid food groups: Sugar, salt, lard, and preservatives, with a double shot of caffeine. Look at this-- it has a shelf life of 37 years! And the beautiful thing about them, Johann, is no matter how many of them you eat, you're still hungry! From a marketing perspective, it's the perfect food! Uh . . . I mean, food product! Here, try one! Really? (pulls out voice recorder:) "Memo to the snack division -- add more sugar." Mr. La Paix . .
Rudy, I wanted to talk about the music with you . . .
Oh right, the music. I keep forgetting. So Johann, I was thinking, we should definitely do some LATIN music. Latin music? Oh, that would be wonderful. My B Minor Mass is all in Latin. Really? We must have missed that one. Oh well, no matter. We already took another one of your tunes and did it up. I think you're gonna like it a whole lot. [To orchestra:] Whenever you're ready, let's run through it. I'm sorry, but I didn't hear any Latin in that piece. Mr. La Paix ? Hey hey hey! Guess what just arrived . . .
Mr la Paix, I need to speak to you about the . . . What are those? What do you think, Johann-- your very own set of ACTION FIGURES! Check it out! [Begins to play with them like a very destructive child] Here comes Telemann with his figured bass howitzer! BLAM BLAM BLAM !!!! And George Friedrich Handel attacks you with an oratorio torpedo!! Blam! POW! Bang! Bang! [Makes gun SFX] ack-ack-ack-ack-ack-ack-ack! Then the Evil Dr. Vivaldi destroys everything in sight! KABLOOEY!!! But you strike back with the Baroque laser death ray!!! [Makes explosion sounds, crushing the dolls in a fury. Pauses to catch breath, then:] And Johann . . . they're going to come out just in time for Christmas! Rudy, do you really think this sort of toy is good for small children? Well, did you ever think of giving them something to do besides expressing anger? Funny you should say that Johann. Speaking of anger in music, allow me to introduce [name]. He's our hip hop soloist. Hip hop? What's that? I've never heard of it. That's because you're over 25. [Name] is going to do his version of one of your songs. [Drum track begins under] Wait 'til you hear this! I said hey, won't you just listen to me? I said how about a well tempered clavier? then one of them said "your music stinks!" That's it, Johann, I think we're through. [senza misura:] really . . . you just watch . . .
big bucks -- limousines -- groupies - everything . . .
instead I'm asking "do you want fries with that? ah what am I saying - who am I kidding? That was really negative and depressing. Well it ought to be, at these prices! I like the way it captures the angst of your disadvantaged urban youth. But I wasn't a disadvantaged urban youth. I grew up in a little town . . .
Johann . . . Work with me, huh? Mr. La Paix . . . Rudy . . . I don't mean to step into your area of expertise, but I admit to being somewhat confused-- all these things you're adding in -- the snack food, . . .
You mean the "food product." Yes, but . . . well, have you ever asked yourself . . . is this ethical? Is this moral? Is this right? Johann, baby, you're getting yourself twisted up over nothing. Why torture yourself over these little details? The music itself doesn't really matter. It's all about perceived value, Johann. We're not selling music, Johann, we're selling an experience. All that matters is if people buy. The music itself doesn't have to be fabulous, it doesn't even have to be good. It just has to be . . . good enough. Mr. La Paix, . . .
Rudy, you have to understand when people listen to my music, I just want them to be HAPPY. HUH??? Johann, C'mere to me. [looks around to see no one is watching] Let me explain a basic tenet of modern marketing to you, Johann. Happiness is BAD for business. Look. A happy person doesn't buy a new car. Why? Because he's happy with the one he's got. A happy person doesn't buy a new CD. Why? Because she's happy with the ones she's got! It's all those unhappy people out there, blindly buying anything and everything in a pathetic effort to become happy, that drives the economy! Johann, if people ever actually became happy, the entire monetary system would fall apart in a matter of minutes! Okay Johann, now that I think about it, maybe this isn't the ideal situation. I admit, I am using the enormous power of the media to make everyone in the world feel miserable, ashamed, alienated, inadequate, stressed out, and socially inferior. But believe me, Johann-- It's all for their own good! But we're talking about human beings! Johann, Johann, Johann . . . Again with the old fashioned thinking. We're not talking about human beings, Johann. We're talking about consumers. And it's our job to make them consume as much as possible! But Mr. La Paix . . . But Rudy, when people . . . I mean consumers . . . hear my music, I want them to feel a greater connection to their spirit. I want them to be elevated to higher level of consciousness. Oh, is that what this is all about? Why didn't you say so in the first place? Not to worry-- Believe me Johann, when people hear this music they'll be elevated! I've got a two year deal with Otis and Beckwith already signed! With escalator clauses included! Now Johann, this has been fun, but enough with the soul searching. Time is money. I want you to hear another one of your tunes that we jazzed up-- A little south of the border salsa for you! I think you're gonna like it a whole lot. Well Johann, those are the charts. One of them is going to make the top 40, or my name isn't Rudy la Paix. Oh, all right, top ten. Hey, I love that positive thinking. Rudy, I know you've been working very hard, and I want you to know I appreciate all you've done for me and my music and during that last piece I think I finally got the idea of what you're trying to do, and I . . . I wrote a new arrangement of one of pieces. [Pulls out a rather pathetic pile of orchestra parts] Could we give it a try? Johann, baby, I love you, you know that, I mean that honestly, I mean that sincerely, but this is serious stuff, and you should leave this arranging to the trained professionals. Who exactly did all of these other arrangements? Oh I dunno. Some guy I found in the yellow pages. But isn't there any room left on the CD? Couldn't we at least try it? Well . . . the polka band DID get deported, but I don't think . . .
All right, all right, we'll give it try, but no promises. [To ORCH] You guys got the parts on the stands? For our friend Johann, we're going to read it through once. And only once. Time is money. Whenever you're ready. And so, the Compact Disc was released. At first, it didn't sell very well at all. No one seemed to like it or even take much notice of it. I knew I never should have signed this guy. He obviously has no talent. [Optional:] Looks like I'll have to go back to my telemarketing job. [alt: Looks like I'll have to go back to working for (name of a company recently involved in ethical/financial scandal)]. But then, something very strange began to happen. None of the pieces the Manager had put together received any notice at all. But the tune Johann had arranged himself, the last cut on the CD, the 50-years behind the times "swing" music that everyone said was "too old- fashioned"-- started to be played on the radio more and more. [Reading Variety or Billboard Magazine]This has to be a misprint-- who would want to listen to this? Some people have no sense of fashion. Gradually, Johann had a small but loyal following of fans. Then there were more and more fans all over the country-- and all over the world! As people heard about the CD from their friends, more and more of them bought a copy. As if by magic, Johann's arrangement slowly made it onto the pop charts. Up, up it climbed-- number 98, number 47, number 9, until lo and behold, it hit number 1 on the charts and stayed there. This is incredible! Say-- [takes out calculator] I wonder what my commission is? His picture was on the cover of Rolling Stone Magazine. At last, Johann was famous, just like all his composer friends. But Johann was more than just famous. He was . . . Backstage, the Manager paced about, totally confounded. "I just don't understand it, Johann," said the Manager. "We had up to the minute market research. We tested with focus groups representing every major demographic. We had state-of-the-art financial projections. And it all went nowhere. The only piece that worked was incredibly old-fashioned. Who would have thought that those simple, little, old-fashioned tunes you were cranking out would have such universal appeal? It's amazing!" "Not so amazing," said Johann's youngest daughter, Regine Suzannah Bach. "My father's music can never be modern or old-fashioned or anything else. It just IS." The agent just shook his head and said, "I guess you're right, Regine. I guess you're right."